Organic venison loin medallions, reared on West Country farms and prepared in the Riverford butchery. 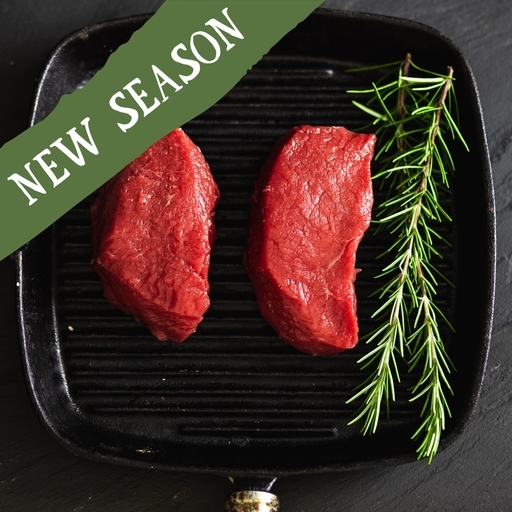 Tender, succulent and lean, this is a fantastic cut – the venison equivalent of fillet steak. The medallions will cook in minutes, and are best treated simply so the quality shines through; just fry or grill until blushing. Approximately 2 venison loin medallions per pack. Oil and season the medallions. Heat a frying or griddle pan until smoking hot. Fry the medallions for 1-2 mins each side, depending how rare you like them. Let them rest somewhere warm for 5 mins before serving.